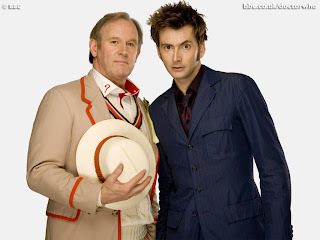 Tenth Doctor David Tennant is going to meet the fifth Doctor, Peter Davison, in a special segment of BBC's Children in Need event in November. Not the first time the Doctor has ever run into himself ("When you travel around as much as I have," he once said, "it's bound to happen sometime. "), but it will mark the first time it has ever occurred within the continuity of the new series. So while it sounds fun (I always enjoyed multiple Doctor stories, even if they do end up being rather silly), it'll be really weird, potentially even a bit uncomfortable to watch. I mean, the costuming alone shows how much the show has changed in its new incarnation. So I'm thinking they're wise to do this as a one-off thing for a charity event rather than making it part of a regular episode. That way, the folks who don't like it can just erase it from their personal continuity. Since we see him regenerate onscreen, I guess it's impossible to have a b-season after Androzani. HOWEVER, he could get old and fat between episodes and then get regressed back to youth before the next one. Yes, that works. Ok, will you buy alternate timelines?